On one fine day two enthusiastic and brave ladies thought to do something different, challenging and to give a unique experience. Those two were our Shilpa and Bharti (Organizers). One of them thought of it and other one implemented it. That’s the power of women. 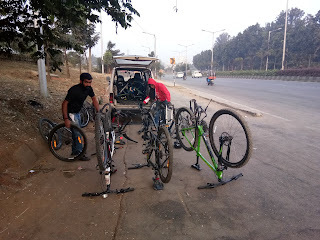 Then two persons from Garage café (vendor) started assembling them to set ready for our ride. We started warm ups before starting our cycling to make ourselves ready before riding. 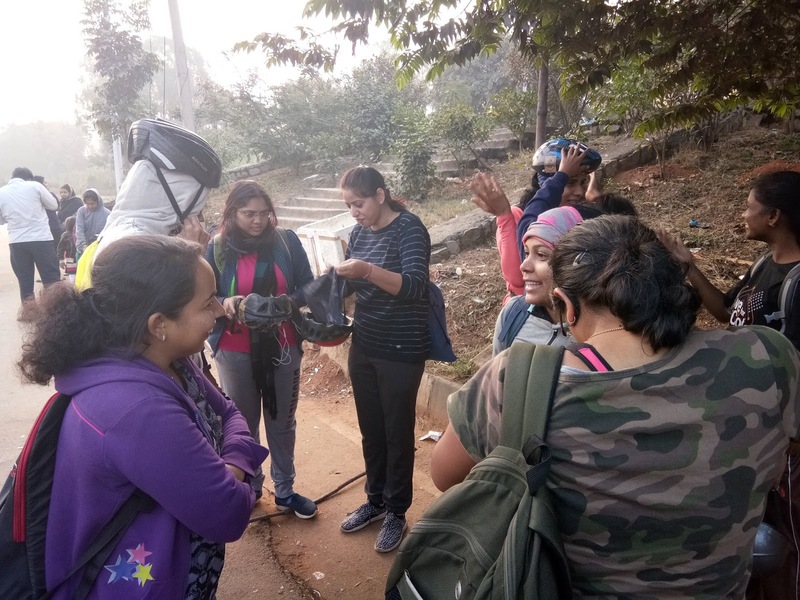 We had a brief introduction about each other and got to know people well before we kick started our cycling journey. We all should be in single line to avoid trouble for public. Our troop will be headed by Shilpa and trailed by Bharti. If anyone want to stop just show hand so that we all can stop together without hitting each other while riding. Don’t leave the group and move fast in some other ways. Try to avoid speaking with peers by moving parallel. We started our journey at 8.30 A.M from Hebbal with small delay than scheduled but it started smoothly and energetically. Each of us had energy booster Banana before our first peddling. Slowly our legs started peddling and get habitual with our lovely bicycle. 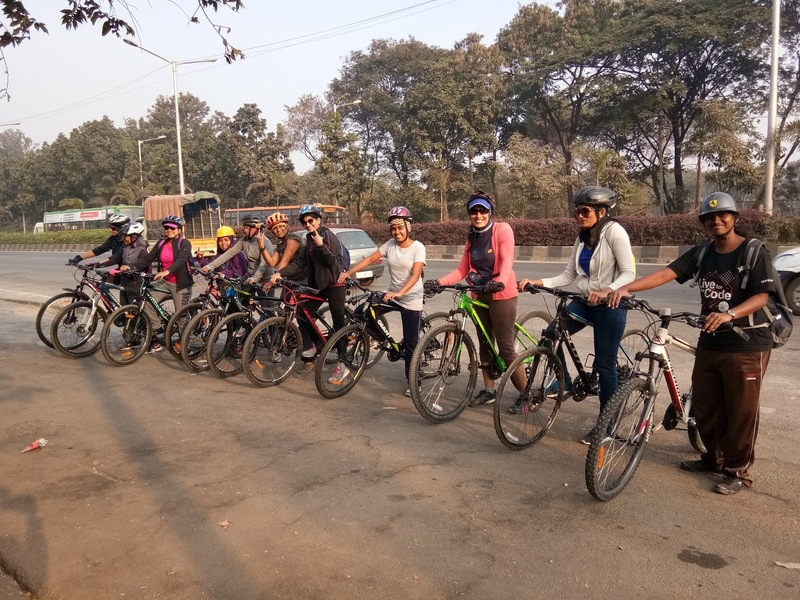 Few of us were first time riders of cycling who never rode even in their childhood and few stopped it with their childhood days. We were thrown back to our childhood memories from our busy routine working days. We moved through typical highways where we have to be very careful while crossing signals and changing roads under hot blazing sun. We were followed by a cab (Vendor- Garage Cafe) who provided mechanical support. We took the help of our well known guide and route map i.e. Google Maps to guide us to travel in clear way to reach our destination. Each of us were able to ride without any breaks till we reached our breakfast spot. Suddenly two of us got missed and rode front without noticing others. Here our Bharti and supporter went in bicycles and brought them back within short time. We had our breakfast to boost up our energy and continue our journey. Finally we reached to our destination Hessarabetta lake. We had to climb up few steps along with our cycles to enjoy the view of the lake. We drank tasty and energy smoothie as a booster after a tired journey. We all took some rest and everyone took so many pictures for their DP’s and Facebook profiles. 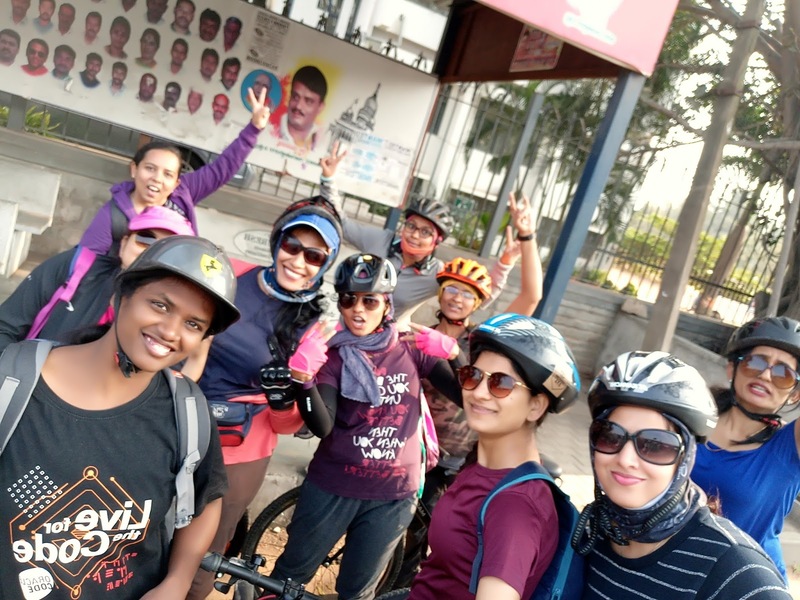 We had taken a video remembering our cycle journey with the help of Vinitha and Banu (Garage Café). a and asked us to enquire further details at reception. The Dance school will be closed by 2.00 P.M for visitors and that time it was already 12.50 P.M. After a small discussion we decided to take tickets and see left over 5mins dance performance. We went and experienced that dance and felt amazed by starring at it without closing eye lids. As time was running, the dance class completed which disappointed us. Manager of the school came and gave some information about the school and dancers etc. We then continued our visit there till closing time. We all took final set of group pictures and solo pictures before leaving that place. As it was already 2.30 and we were hungry, we all opened our foods and sat under some shelter to consume it. We were surrounded by more number of dogs than the count of us which made us to feel little afraid to eat peacefully. Finally had good food and shared the food to dogs as well. 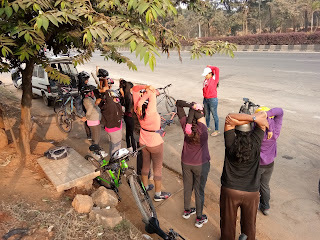 Now everyone was in a dilemma and waiting for organizers response whether to travel in cycle till the spot where we started or by bus. As it was too late and cycles had to be handed over, we had to travel back by bus. We rode our cycles till bus station of Hessarabetta and started in bus. Everyone got seated and decided where to get down. Before we left, we were welcomed to give our feedbacks which will help organizers to improve if necessary. Each and every feedback showed their happiness and experience through this cycling. That’s how our half day cycling ended as full day with visit of new places and experiencing new paths in different way. Big and hearty thanks to our leaders Shilpa and Bharti. Cheers to all of us who made this journey wonderful with our support, laughter and help at required times.